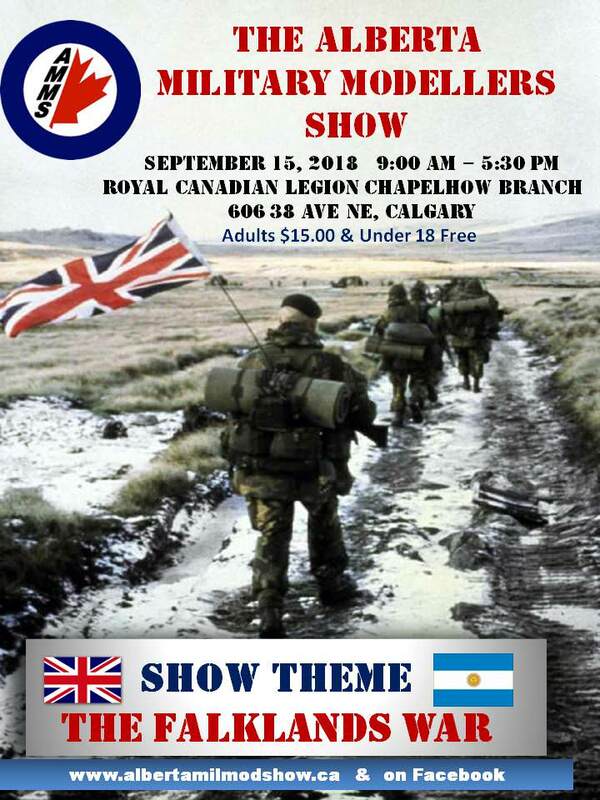 The 17th annual Alberta Military Modellers Show is being held on Saturday, September 15, 2018 in Calgary, Alberta at the Chapelhow Royal Canadian Legion, 606-38 Avenue NE. Show registration starts at 9:00 am and the show will wrap up after the award presentations at 5:30 pm. This year the show theme is The Falklands War and will lend itself to some amazing figure, aircraft, naval, vehicle, and diorama entries. The entry fee for adults is $15.00 with unlimited entries. For under 18 years entry is free with unlimited entries. Every youth entry will receive an award certificate and a choice of a new model kit. A $2.00 visitor fee for all spectators and supporters. Vendor tables will be very prominent this year so bring your stash cash! Check out our Facebook page for more details and show images! Have a fantastic fall season and keep on building!! !